I already discussed this in my Motorola Atrix post in early January, but I’m so excited about the possibilities of these recently announced systems-on-chips (SoC) and how they in due course will change the way we use computers. I don’t think many people realize it now — a better way of putting it is perhaps that people don’t care to think about it, but these chips will eventually bring about a minor computer revolution. The fact that processors for mobile devices comparatively soon will carry the power of desktop PCs will ultimately result in our phones being our computers. Just to be clear: we’re talking quad-core 2.5GHz mobile processors the size of coins with very strong GPUs – completely silent and with ultra-low power consumption architectures within a year. 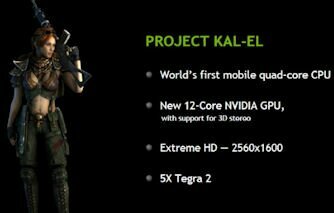 Quad-core chips will hit Android devices in late summer 2011, and the Nvidia Tegra Stark, expected to arrive in 2014, will deliver 100x the performance of current dual-core 1GHz Tegra 2 chips. 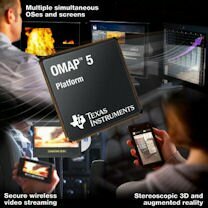 Qualcomm (Snapdragon), Texas Instruments (TI OMAP 5) and Nvidia (Tegra) all have super mobile processors in the works. Pretty mind-blowing. Update February 18, 2011: Imagination Technologies, the company behind the PowerVR GPU that’s part of the ARM SoCs in devices such as the Galaxy S and Droid 2, has unveiled its new Series 6 PowerVR chips codenamed Rogue. These GPUs will have the horsepower of today’s graphics cards in computers while only needing a milliwatt of juice. Now, why do I find these new CPUs so intriguing? I’m a wordy guy, this article is quite long and I ramble, but it leads up to the point I’m hopefully going to make – so please bear with me . When I started to get really into phones in 2003, I felt that mobile devices were our new computers, and I was just as fascinated by phones as I had been by PCs ten years earlier as a kid. It’s somewhat difficult to explain, but the two main, magical qualities I felt mobiles had were that I could carry them with me in my pocket wherever I went, and that they could replace so many other devices. A mobile felt like the ultimate gadget, a slightly futuristic super gizmo that was on the frontier of computer technology. I wasn’t interested in other portable devices such as MP3 or video players, digital cameras, GPSs, gaming handhelds or heavy laptops – I was even put off by the idea of owning one of them. A bulky device that only can play songs, only play games or only tell me where I am – why the hell would I want that? It would just slow me down. Sounds weird, perhaps, but that’s how I felt and still feel. To just have one device that can do all the things almost every other mainstream electronic device can brings a certain freedom. In 2009, I wrote an article listing 35 gadgets the Nokia N97 could replace, and I later wrote a similar piece for Androinica and I then came up with 45 gizmos (with a total weight of 110 pounds) that smartphones have made redundant. One thing my mobile hasn’t been able to replace in spite of all its powers and versatility, however, is my desktop computer. But within a year or two, that could change. Because of my love for technological convergence, you can understand why I was so geeked out about the Motorola Atrix. It introduced a new idea: the execution wasn’t flawless, but it was a hint of what is yet to come. The idea is that the pocketable computer that is our smartphone can act as the brain of other types of computers, such as a laptop or a media center. You just insert the mobile in a dock, and the handset will present a different OS environment depending on which dock you’ve put it in. In my Atrix article, I envisioned a not-too-distant future in which we all (at least the nerds and the tech-savvy) carried our computers with us in our pockets wherever we went. These computers could be used as we use our mobile devices today, but with a vital addition: by simply connecting them to a docking station, they could be turned into laptops, tablets, media centers, or desktop computers. In this future, there would be a universal standard for the docking stations, and there would be no need for dedicated netbooks, laptops, tablets, or PCs: just your smartphone and various physical, lightweight shells for it. These shells would ideally be available in hotel rooms, on airplanes, trains, in Internet cafes, and so forth. The mobile hardware power required for this future to materialize will soon exist, and it’s easy to make a device boot up different OS environments depending on where you dock it. Some Android phones already have stronger hardware than current video game consoles, so they could easily replace them as well. A dock that allows gamepads and TVs to be connected to it is the only requirement – the phone will bring the games and the processing power. Or the controllers could be connected directly to the phone via Bluetooth. Of course, putting your handset in docks and taking it out again on a daily basis may not be that practical, so having a dedicated desktop computer or a video game console will of course be preferable for some people. But devices I see no reason why a phone couldn’t replace are laptops, netbooks, tablets and of course gaming handhelds (who would buy one these days?). I was initially planning on getting a Honeycomb tablet, because let’s face it – the OS looks amazing, brimming of potential. However, for the reason stated earlier — my love for convergence, I soon started to question buying one. I decided to eventually get a phone with a 4.3”+ screen instead, and most great new additions in Honeycomb will come to Android phones as well, anyway. My fondness of One Single Device to rule them all is still present. I don’t want to be carrying around a tablet in addition to a phone that’s capable of most of the things a tablet can do. I believe that the new mobile computer super chips and docks that can turn our increasingly powerful (Android) smartphones into various devices are the future of computing, and I hope that this tomorrow will arrive sooner rather than later. Who else wants this?